Saaranya Kumar Dasari hails originally from Akividu in the south-east of India. 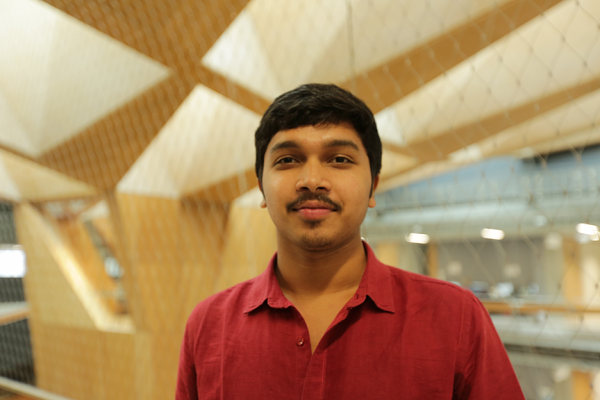 After moving to Chennai to study a Bachelor’s degree in Civil Engineering, Saaranya has made his biggest globe-trotting leap yet: a semester abroad here at the University of Melbourne, based in the Melbourne School of Design. “I’m really enjoying my time here so far, the University has an excellent reputation which attracted me to come here. I love the architecture, the climate and the students here,” Saaranya says. The MSD visited Chennai in 2015 where Assistant Dean (International), Dr Toong-Khuan Chan (referred to as TK) was referred onto potential students like Saaranya who wanted to study abroad. After some correspondence, Dr. Chan (TK) encouraged Saaranya to come to Melbourne. Saaranya extended particular thanks to TK for helping him adjust to University life here. There are many differences between the higher education systems in India and Australia. As an aspiring civil engineer, Saaranya has enjoyed taking subjects in construction and sustainable building systems. His time here has helped shape the direction of his future and given him a more global perspective and skillset. When asked about his favourite spots on campus, Saaranya responded with campus spots old and new. The University and the MSD wishes Saaranya a warm and enjoyable time during the rest of semester two here.